Great cushioning to weight ratio. Plush and comfortable fit out of the box. A touch of support from a medial footbridge. The Triumph lacks the flexibility of the other popular Saucony models such as the Cortana or Ride. Price increase for basically the same shoe in the last two versions. The Triumph 11 is a full featured shoe with great cushioning in the same vein as the Asics Kayano and Brooks Glycerin. High mileage runners, or heavier runners, looking for plush cushioning and maximum features. The Triumph 11 is a maximum featured neutral shoe designed for high mileage road running. The Triumph 11 from Saucony is a shoe that has undergone very little change over the last three years, which is way it maintains a loyal following. Saucony kept this update mostly in the color of the upper and what you can expect is the same great and dependable Triumph. 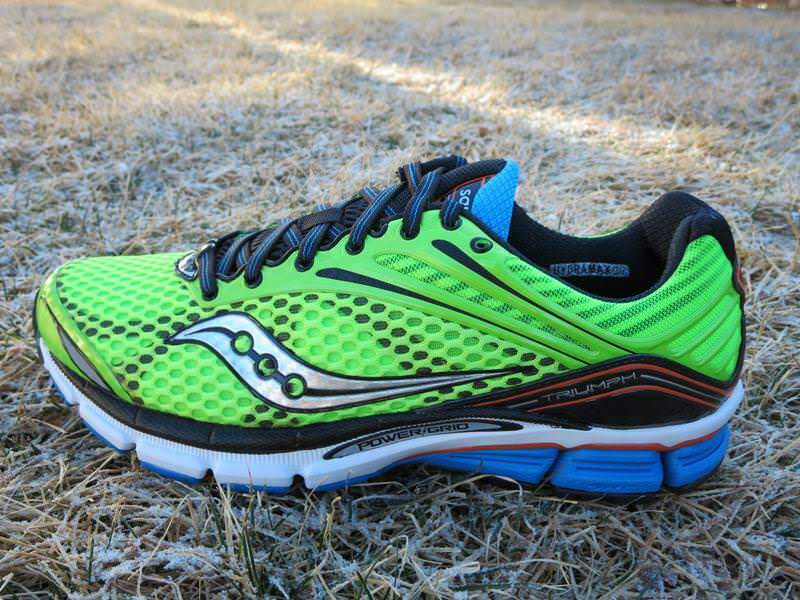 Saucony Triumph 11 Upper: The biggest changes here come in the upper for the Triumph 11. Several additional welded on overlays were added to improve the fit over the last incarnation which adds a whopping .2 oz to the overall weight. On can expect a very plush feel around the heel collar and this is an upper that really pampers the foot. Open air mesh provides breathability for most of the foot and a well padded tongue protects the top of the foot underneath stretchy flat laces that stay tied very well. Why these laces haven’t become an industry standard on road shoes I will never know, but they are one of my favorite features of Saucony shoes. Again, very few changes here over the last two versions. 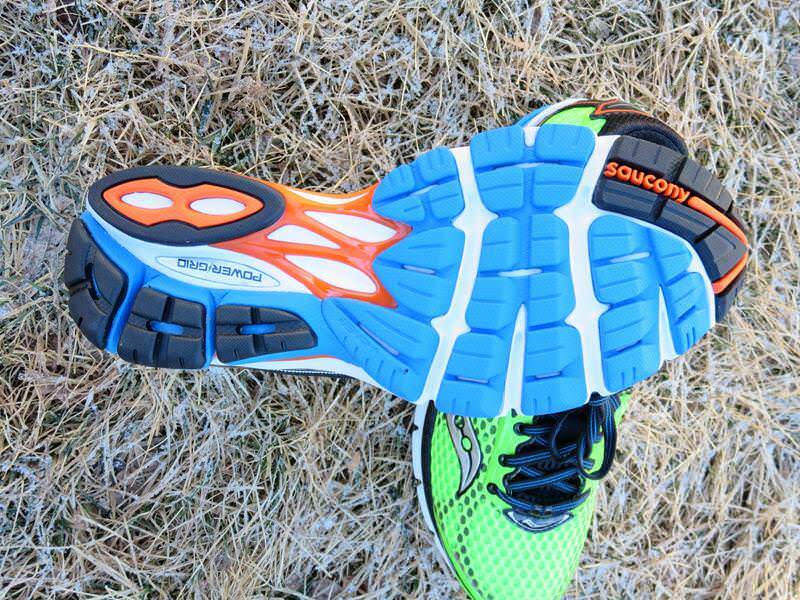 Saucony uses their Powergrid system utilizing Powerfoam to dissipate footstrike shock throughout the midsole. 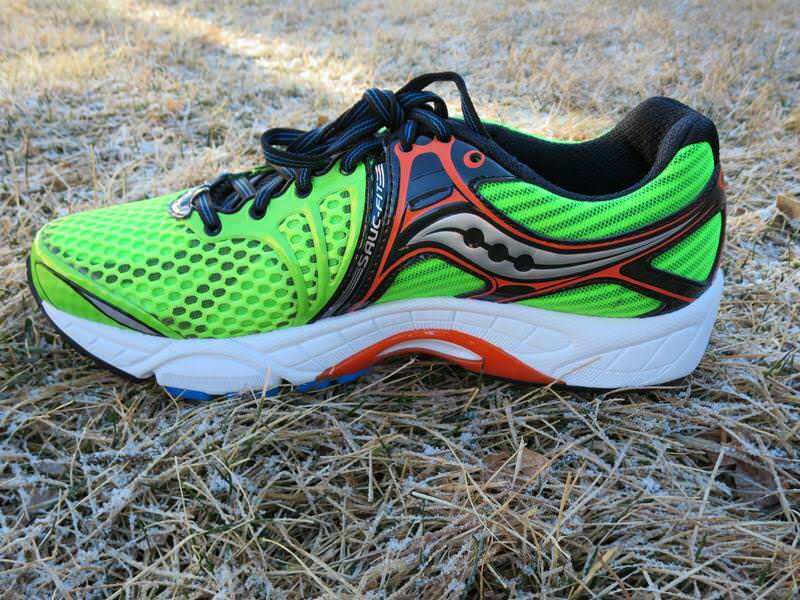 Powerfoam is very lightweight and responsive and Saucony’s SSL EVA is featured throughout the midsole. SSL EVA is a very lightweight foam that feels very springy and is featured here prominently through the forefoot. Being a mid foot runner I appreciated a fully featured shoe that doesn’t expect me to heel strike. 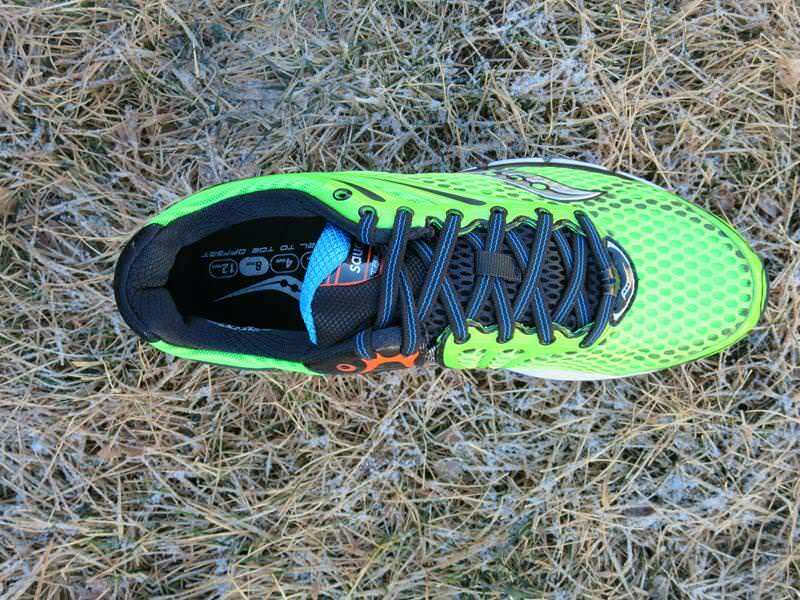 Saucony also kept the heel drop of the Triumph at 8mm which also helps with transition. There is a Midsole Support Bridge, a thermoplastic unit, which runs from the heel to the mid foot and decreases torsion through the foot strike. This does reduce flexibility a bit despite flex grooves in the heel and forefoot. But, flexibility does improve with additional runs in the shoe. Saucony uses IBR+ outsole rubber in the forefoot which seems to add to the well cushioned feel of the Triumph 11, and it is also a fairly sticky rubber that performs well on wet roads. About two years ago I rated the Triumph 9 and I gave it an 8 out of 10. Why the change? Isn’t this the same shoe essentially? Yes, it is, but Saucony has not reduced the weight in any way (something I consider to be an easy improvement to make given the advances in foams over the past two years) and the shoe is now $140 which puts it far out of my price range. To me, this is a shoe that Saucony should be charging $20-$30 less for as the look and materials seem outdated to me. 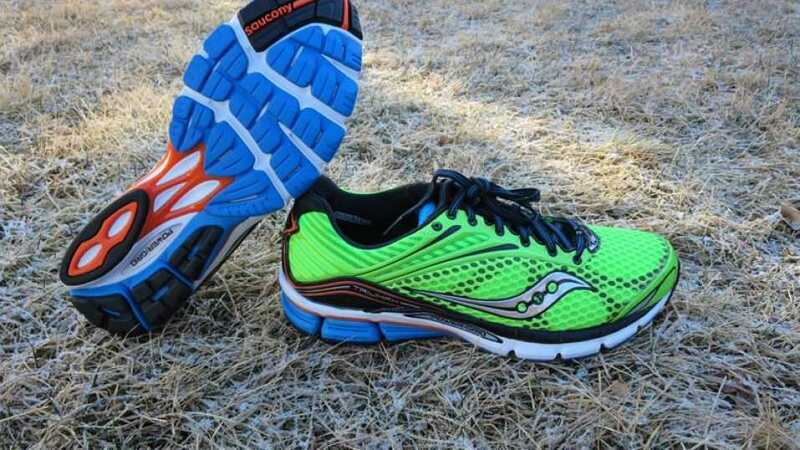 Compared to the new Saucony Ride 7 coming out this spring/ summer the Triumph looses a great deal of luster. Sometimes I feel that companies price certain shoes to be their coup de gras and price hikes become a manner of keeping up with the Joneses rather than creating innovation. I wouldn’t necessarily recommend a customer to buy a Triumph over a more advanced shoe such as Saucony’s Cortana, which costs only ten dollars more and saves you nearly two ounces! So, I don’t mean to dog on anyone’s perennial favorite shoe here, but I would like to see some innovation in the Triumph and my guess is that a complete overhaul is probably around the corner. Don’t get me wrong, this is a fantastic shoe. But to release a “new version” every year with exactly the same features seems silly and is misleading to runners. They could still be making the Triumph 9 in different colors and nobody would know the difference. 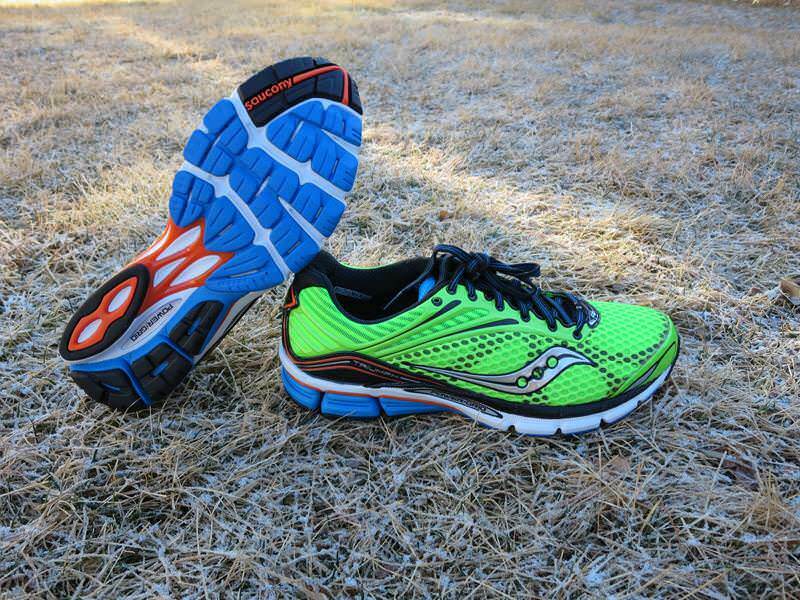 We thank the nice people at Saucony for sending us a pair of Triumph 11 to test. This did not influence the outcome of the review, written after running more than 50 miles in them. I love the “squish”/cushioning of the shoe, wider toe box, and the low drop. Thanks! How does the Triumph 11 compare with the Guide 8’s? I am rating this based on the pair of triumph 10 that I have. It seems from the images and the review, there has been little change. I like the Triumph 10 as a responsive shoe with medium cushioning. Not super soft but a good balance. Really good fit, the Triumph 10 hugs my feet well. Just recently bought the 11s and so far so good. Thomas is right; it’s essentially the same shoe as the Triumph 10s, but I used to be faithful to the Nike Vomero, but I hated all the changes they made to the Vomero 7s, so a little bit of continuity is ok with me. Thanks for a great site!. I bought a pair of Triumph 11 and love them to bits. Is there perhaps a trail running shoe that has more or less the same features and feel as the Triumph 11. I understand that trail running shoes are totally different than road running shoes, but I would like something that is close to the Triumph 11. I just bought one, it’s very comfortable. They provide very good protection to my ankles. I’ve ran a lot of miles in the Triumph 10 and really liked the shoe. Recently bought the 11 and it has less cushioning in the heel than the 10. 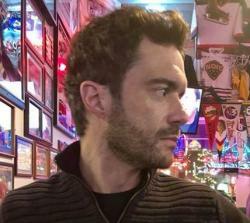 I wasn’t happy about that. I don’t purchase the Triumph to have a fast light weight shoe. I purchase it to have a highly cushioned shoe. It seems to me the Triumph is losing its luster. Maybe it’s time for Saucony to give the Triumph a total remake.